The project was initiated in 2001 after the creation of a master plan by Cooper, Robertson & Partners that reconceived the campus. 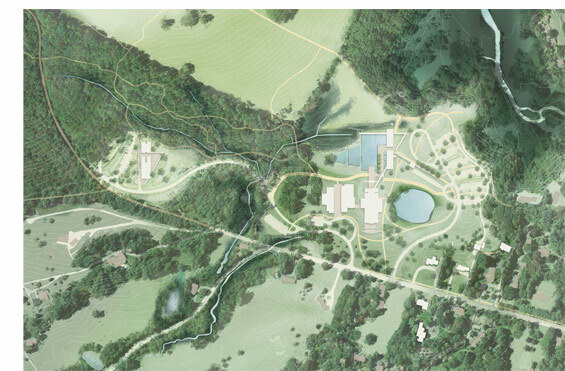 The Clark’s entire 140-acre campus is renewed and enhanced by the introduction of four miles of new walking trails, five new pedestrian bridges, and more than a thousand new trees. 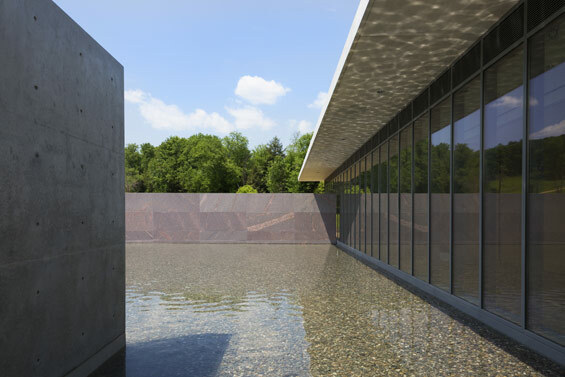 But the focal point of the landscape is a set of tiered reflecting pools. 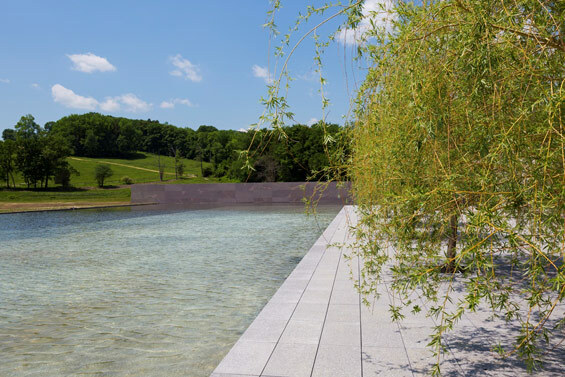 Reed Hilderbrand Landscape Architecture designed the pools, with their cascades, lawn embankments, and stepping stones to knit together the architectural refinement of the inner campus with the pastoral sweep of Stone Hill Meadow and the meander of Christmas Brook and its wetlands. 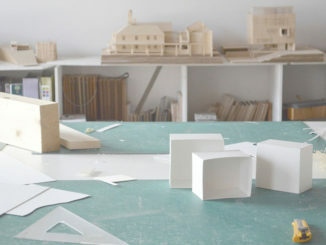 In order to meet the environmental and experiential goals of the Clark and the community, the pools needed to fit into the site’s topography, hydrology, and habitat. 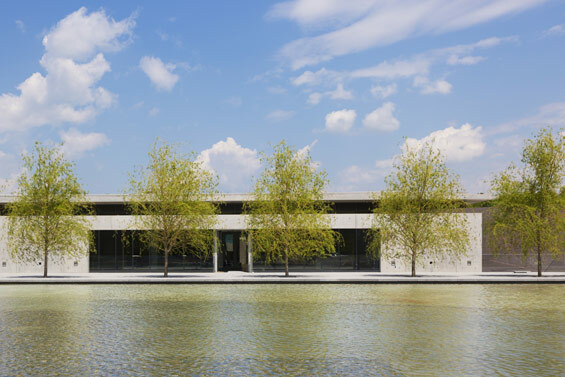 Conceived by architect Tadao Ando as a unifying element for the campus and its surroundings, the pools orchestrate a unified composition among the diverse architectural characters of the Clark Center, the Museum Building, the Manton Research Center, and the varied landscape beyond. 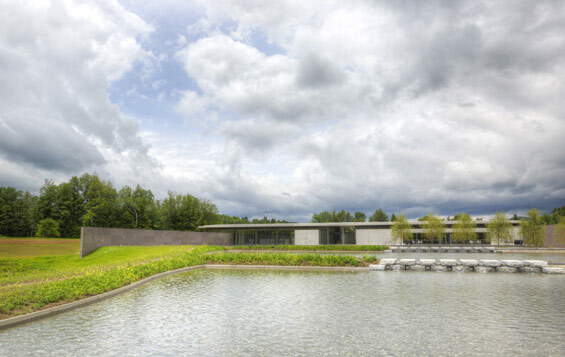 The Clark Center terraces overlook the uppermost pool, which reflects views of wetlands and woodland beyond as visitors arrive. 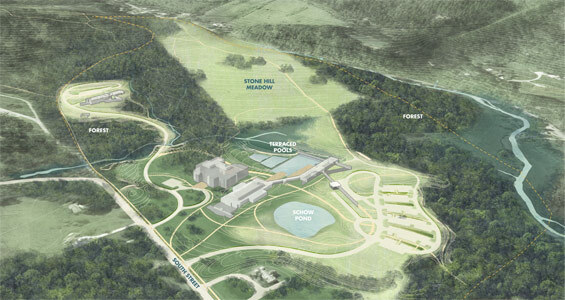 The entirety of the pools links the cultivated lawns of the central campus with the pastures of the Stone Hill meadow and the intricate network of streams that define the site’s drainage systems and shape its habitat. Lawn walks and embankments thread between the pools. Water cascades through granite weirs from one pool to the next and then is recycled through a system that integrates rainfall capture, stormwater management, landscape irrigation, and building systems, including climate control and toilet flushing. The water management system designed for the Clark, prominently represented by the tiered pools, was conceived to reduce total water consumption for the expanded campus through the interconnection of landscape and building water sources. This system transforms what would have been considered wastewater into a resource; balances the need to rebuild groundwater through infiltration on site with the desire to offset potable water use in the building; and improves the health and performance of surrounding wetlands and streams through careful mitigation of storm events and runoff. Original modeling of total water savings, based on a first design study, forecast no potable water consumption in the landscape. As-built performance modeling is forthcoming. 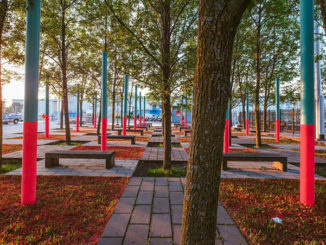 The Clark has also elected to commission the entire landscape, as one does for building mechanical systems, to enhance and evaluate the performance of all of its landscape features and assets and to provide a model for future projects.